Expect compliments when you wear this silver-tone beaded multistrand flex bracelet. Multistrand design offers a layered look. 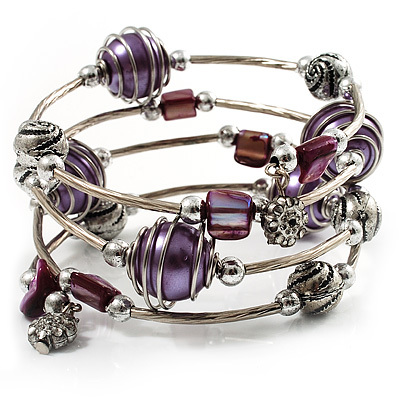 Purple, silver-tone, shell-composite and metal beads add fashionable flair. Silver-tone finish provides sleek shine. Flex styling ensures a custom fit. This stunning bracelet can be twinned with the matching earrings E01356 and a necklace N04480 to create a delightful combined set. Also Available in Orange, Navy Blue, Black,Teal Blue, Apricot Yellow, Chocolate Brown, Fuchsia Pink, White, Red, Light Blue, Multicoloured, Dark Grey, Olive Green, Forest Green and Light Pink.